I am now exhibiting some of my animal themed pictures and commissions at Smiths Farm Shop, Brampton Lane, Chapel Brampton, in their newly built pet department. 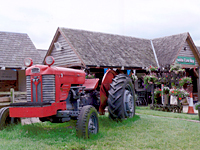 Opening times are Monday - Saturday 9am - 5.30pm and Sunday 10am - 1pm. 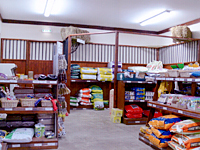 Smiths offer a really enjoyable shopping experience, supplying top quality local produce and now a comprehensive range of pet foods and accessories. I felt proud to have recently had two pastel portraits selected for the Northampton Town & County Art Society exhibition, currently open at Northampton Museum and Art Gallery, on the Guildhall Road. The two pieces, were a self portrait and the tiger, which can be found on my 'Pastel art for Sale' page. The art exhibition is open from October 29th until Decmber 10th and is displaying a wonderful selection of pictures and sculptures, all selected from the best of Northampton's artists. Most of the work in the exhibition is for sale, so please come down and take a look. 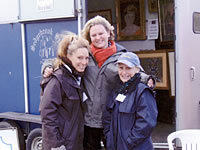 When I displayed at Towcester race Course, I took along family help in the guise of Caroline and Catherine. Towcester is a large and popular event in the horse calendar, and so was an ideal opportunity to exhibit commissions and private work of horses done in pastels. 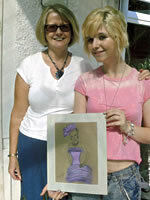 Pictured to the right is a young artist from Wolverhampton in the West Midlands called Danni. She contacted me after seeing one of my commissions, and asked if I would be able to spend some time with her to help develop her skills as a fine artist. Danni and her auntie Barbara spent a day with me at my studio in Northampton, where we spent an enjoyable day covering the basics working with pastels. This evening was held at the Spencer Arms in Chapel Brampton, just outside of Northampton. The evening included an exclusive meal and an auction, where the proceeds raised were presented to Great Ormond Street Children's hospital and Northampton Air Ambulance. 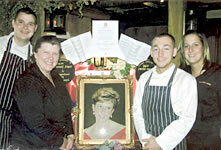 Both charities of the late Diana, Princess of Wales. Purely Pastels opened it's doors last summer for invited guests to enjoy an afternoon browsing private work created earlier that year. 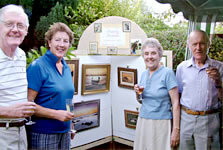 Guests were able to chat with Tracey, and some purchased private pieces from the studio for their homes and friends. 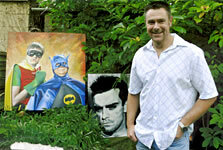 Also exhibiting work was local artist Steve Essom. 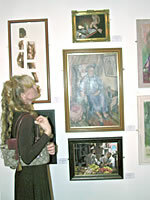 Back in 2004, I held my first exhibition at Sedgebrook Grange, Chapel Brampton. 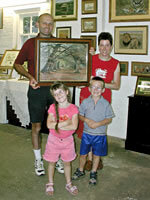 Pictured with their purchase are Mr and Mrs Bowden and their children. They chose an avenue of trees, I saw one day and decided to recreate it in pastel.